On the 28th of September ANZ will be transforming Queens Wharf in Auckland CBD into a Winter Wonderland. A ice skating rink will be set up at the wharf and will be open for 10 days. This rink will b e fully covered so you can skate rain or shine. This event is FREE so make sure you head a long and practice your ice skating skills. This entry was posted in INTERNeX, new zealand, Uncategorized and tagged ice skating, INTERNeX, new zealand, winter on September 26, 2012 by INTERNeX New Zealand. Bungy jumping is a popular activity here in New Zealand. The idea of bungee all started in Vanuatu where legend says a woman threw herself off a cliff with a vine attached to her leg. The idea evolved and in the 80s two people called AJ Hackett and Henry van Asch, who met while skiing in Wanaka, decided to develop and test bungee cords with help from scientists from the University of Auckland. Many tests were performed on these cords and eventually the idea was ready to launch to the world. The first commercial bungy jumping operation opened at Kawarau Bridge in Queenstown. This jump is 43m long. New Zealand’s highest bungy jump is 134m long!! In this jump- The Nevis Bungy- you jump from a high wire cable car above the Nevis River and fall for a total of 8.5 seconds! There are several options in Auckland for those who want to experience the adrenaline rush of bungy. The Auckland Harbor Bridge bungy is 40 meters long and one of the best experiences you could have here in Auckland. The Skytower also offer a ‘sky jump’. This jump is described as ‘base jumping’ and is a little different from a bungy as you are attached to a wire. You fall at around 85kph for around 11 seconds. I’ve attached a photo of me on the Auckland Harbor Bridge bungy and I can safely say it was one of the best things I have ever done! 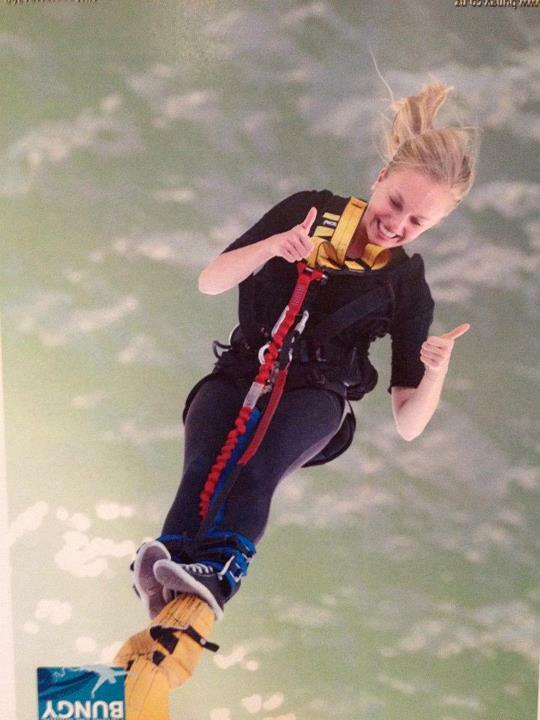 So, challenge yourself and do a bungy jump- it promises to be one of the most thrilling things you will ever do. This entry was posted in INTERNeX, new zealand and tagged auckland, bungee jumping, INTERNeX, new zealand on September 24, 2012 by INTERNeX New Zealand. Hi everyone, my name is Georgia and I have recently joined the team here at INTERNeX New Zealand. I’m a university student in my second year studying for a Bachelor of Commerce and Bachelor of Health Science conjoint degree. I’ll be working with admin and social media and keeping everyone up to date with upcoming events and highlights of the week. I love travelling and learning about new cultures and I hope to share with you some exciting things to do here in New Zealand! Where: The Cloud, Auckland Waterfront. Tickets to this event are limited, if you listen out to one of these radio stations- ZM, Flava, Radio Hauraki and Classic Hits- you might be able to win some tickets, or you can visit the ANZ Facebook page to enter. If you aren’t able to get a free ticket you can still go to the waterfront to watch the fireworks display, which is said to be one of the largest ever in NZ!! When: 29th September 2012- 14 October 2012. The Auckland Heritage Festival being held from 29/09/2012 to 14//10/2010 Is a great opportunity to celebrate Auckland’s Heritage and learn more about the city by participating in some cool free activities such as tours of historic sites, concerts, walks, film screenings and much more. To find out more visit the Auckland City Council website. What: Investec Rugby Championship All Blacks vs South Africa. This Saturday the All Blacks are playing South Africa in the Investec Rugby Championship. The game will be played in the new Forsyth Barr Stadium in Dunedin. Head down to a local pub to watch the All Blacks take on (and beat 😉 ) South Africa- 7.35pm. A new Milk and Cookie bar called Moustache has just opened on Wellesley Street behind the civic. Check it out this weekend and try some of NZ’s best homemade cookie and milkshakes all made with local ingredients. There is a NZ Geographic Photographer of the Year exhibition on at Auckland Museum from the first of September right through to the 3rd of February 2013. This exhibition has a great display of some of New Zealand’s best photography. This entry was posted in INTERNeX, new zealand, What to do on the weekend and tagged auckland, INTERNeX, new zealand, rugby on September 14, 2012 by INTERNeX New Zealand.